Unknown could have used a better title. I have one idea: Nothing Good Comes From Being Married to Betty Draper. In Unknown, Liam Neeson is Bourne again, after a random accident where his taxi drove off a bridge into a river, placing him in a coma for four days. 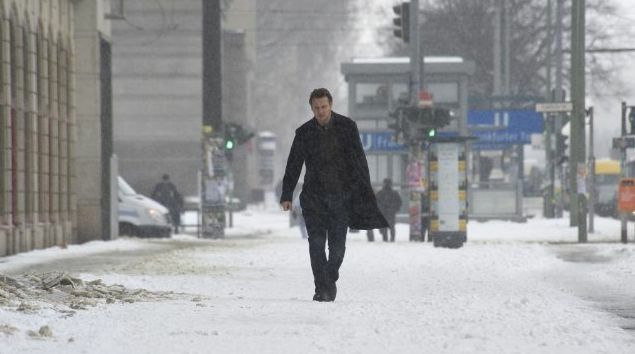 Neeson had arrived in wintry, photogenic Berlin with his wife January Jones for a biotechnology conference. After the accident, Jones claims she has no idea who Neeson is, and Aidan Quinn has taken his identity, his place in the conference, and his wife. Is Neeson crazy? Is he who he believes he is? No and yes. And no. A desperate Neeson eventually finds Diane Kruger, the woman who drove the cab that went off the bridge and saved his life, and together they blaze a bloody trail across Berlin, bashing skulls in bloody brawls and smashing cars in chaotic car chases, seeking answers for Neeson. Kruger, a veteran of running across the United States with Nicolas Cage hunting for National Treasures, is quite at ease on the run for her life with a guy who could be crazy. Bruno Ganz is terrific as an elderly former agent of the German secret police whom Neeson enlists to help him. When Frank Langella appears towards the end of the picture, Ganz and Langella have themselves a crackerjack scene that ends with cyanide. (Like Sir Ben Kingsley, I no longer recall a time when Langella can appear on camera and one didn't automatically suspect him as the villain.) Unknown takes the elements of The Bourne Identity - an American amnesiac in Western Europe, shadowy agents trying to kill him, a conspiracy he must unravel his role in, and a down-on-her-luck ex-pat German girl who becomes his ally - and jumbles them around in a preposterous but entertaining fashion. Neeson is no Jason Bourne; he's not a deadly weapon questioning his existence, he's just an ordinary man trying to make sense of an impossible situation. Or is he? Unknown has its cake and eats it too.